But I finally had my long-awaited appointment with a new (regular) endocrinologist on Monday, and while there's no news yet, per se, at least I feel like he listened to me, which is more than I can say for the last two I've seen. He took a thorough history, and talked with me like I was a person, not a file. And he drew blood right there in his office, without sending me to three other places first, promising that he'd call me soon; in fact, he asked how late he could call, and whether it was OK to call past 9. I left feeling hopeful, at least. He said that while it was unlikely that my thyroid was the problem, given my previous test results, he would still check to see if I was one of those rare people who need T3 in addition to T4, and that if that wasn't it, that there were a few other things to consider. Among them, he mentioned anemia, which I didn't think could be linked to IF, but which he thought might be contributing to the symptoms I've been experiencing. I found myself defending what I realized is now a nearly-vegetarian diet: while I still do eat meat, I've been eating a lot less of it, and hardly any red meat at all. "But I eat lots of vegetables containing high amounts of iron," I protested. "You'd have to eat a truckload," he responded. Now, with all due respect, I know plenty of vegans and vegetarians who seem to get all the iron they need from greens, lentils, and other legumes; no need for a burger. I've been eating great big bowls of spinach salad for lunch recently, and I know I've mentioned my love affair with kale previously here. Kale is, simply put, a superfood, packed with nutrients and compounds like beta-carotene, vitamin C, iron, manganese, calcium and potassium. (On the down side, it so happens that kale contain goitrogen, a naturally-occurring substance which can interfere with the functioning of the thyroid gland, but let's leave that aside for a moment, since it's not like I'm subsisting solely on the stuff.) It so happens that I cooked some this week, in a dish that even my three year old son gobbles down with gusto. The original is here (I love Dana's blog for its fresh vegetarian ideas and beautiful photography), but I don't bother with the cilantro or basmati rice or yogurt sauce; we just use a dollop of plain Greek yogurt if we're feeling like we need contrast. I do like to serve it with roasted cauliflower, but then again, I eat that all the time, too. Here's hoping the plant-eaters I know aren't wrong. Heat a medium pot over medium heat. Add just enough oil to cover the bottom of the pot and add the shallot, garlic, and ginger. Season generously with salt. Stir until softened but not brown, about 2-3 minutes. Sprinkle on the spices and stir until fragrant, about 1 minute. Add the chickpeas and toss to coat with the spices, then add the crushed tomatoes and tomato paste. Mix together well and bring to a simmer. Add the kale and give it a good stir. If the pot seems to dry at this point, add a little water – about a tablespoon at a time – to keep things moist. You don’t want it soupy but you want enough liquid to cook the kale. Adjust the heat to keep it at a simmer and cover the pot. 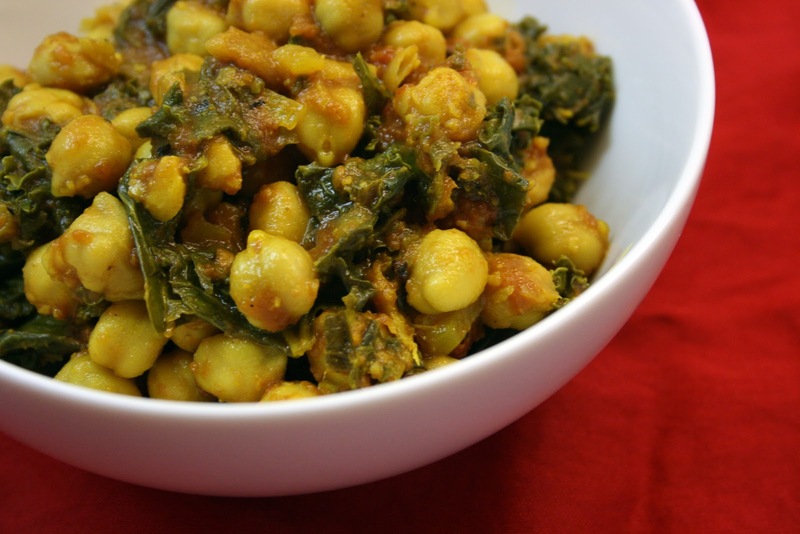 Continue to cook, stirring occasionally, until kale is very soft, adding water as necessary. My yoga teacher said on Monday that yoga practice is about three things: effort, letting go, and observation about how that balance is working, how we feel in the midst of that cycle (without trying to change the feeling--just noticing it, and accepting it). If only I could learn how to do the second and third of those things as well as I do the first. I have thrown myself into cooking again to drown out the cacophony of pregnancy announcements this week, three on a single day. One from a neighbor down the block with a little boy Ian's age, who is now expecting her fourth child. Another from a colleague who runs a mom's group at work, who has thoughtfully spaced her second child two years from her first, because isn't that what everyone does? Another from one of the support staff members at work, whose daughter I worked with, and who is expecting her first. I am happy for these women. They are good people, and they deserve joy. But every time I hear another announcement, I feel incomplete, flawed, empty all over again. Hard as I try, I can't seem to quiet those voices in my head. How long will it take for them to go away? Next week, I have an appointment with a new endocrinologist. Not an RE, not yet. I'm anxious about it. What if he says I'm fine, despite the constellation of symptoms that suggest I'm still not being treated for thyroid issues? I fear trying again without a new treatment for an old diagnosis, both because I fear loss, and because I fear the disappointment of a non-event. But I also fear the journey into reproductive endocrinology. Can I just be happy with the beautiful little boy I have? Is this the universe's way of telling me that I should spend more time paying attention to him before I am gifted with another child? Today is Earth Day, and I am celebrating by practicing letting go (not to be confused with "if you'd just relax, maybe it would happen, which the ICLW folks know works really well, right?! ): balancing my effort with surrender to the new life that is everywhere around me. Young asparagus, fragrant flowering trees, chives in the window box on our deck. 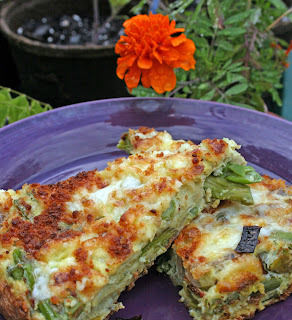 I made this frittata as a nod to spring and to this renewal. It's another one of those recipes that is very flexible; you can substitute just about anything seasonal (preferably local), and change the cheese and seasoning to your taste. Svadhyaya. Self study and observation. May we all seek a little better balance. Preheat broiler. Heat olive oil in heavy broilerproof 10-inch-diameter nonstick skillet over medium heat. Add leeks and sauté 4 minutes. Add asparagus and shiitake mushrooms, sprinkle lightly with salt, and sauté until tender, about 6 minutes. Whisk eggs, 2/3 cup Fontina cheese, 1/2 teaspoon salt, and 1/2 teaspoon pepper in medium bowl. Add egg mixture to skillet; fold gently to combine. Cook until almost set. Sprinkle remaining remaining Fontina cheese and Parmesan cheese over. Broil until frittata is puffed and cheese begins to turn golden, about 3 minutes. Cut into wedges and serve. Thursday is Earth Day. I've been thinking a lot about Earth Day this year, partly because there are so many events in our region to commemorate it (we attended one today at Basil Bandwagon, where Ian got to pet an alpaca, check out books from the Bookmobile, make a newspaper pot for a small basil plant, and color a "reduce, reuse, recycle" poster). But I've also been reflecting on the changes I've tried to make in my life over the past year to live more mindfully and sustainably. Earth Day empowers us to make better choices; it reminds us that even one person can make a difference. It's a day that is about life and living (which helps keep things in perspective for me when I feel like dwelling on IF, which I'll probably do in my post tomorrow). Certainly, I recycle even more than I used to; it's become a compulsion. We already had among the least amount of garbage on our block, but now I find myself reusing aluminum foil, recycling toilet paper rolls, and packing things in repurposed containers rather than in plastic bags. I try to choose products that have a smaller environmental impact: less packaging, fewer harmful chemicals. Most recently, I've started eating a lot less meat, and when I do eat and cook it, trying to make sure that the animals are humanely raised. And since I do most of the cooking, this means that my family is eating less meat, too, though the boys seem to need ham in their diets, for some inexplicable reason. This year, I'd like to try to eat more locally. We eat a lot of bananas, frozen vegetables, and things that are out of season. Some of this is probably hard to avoid, given that I don't can things in the summer and that I know that frozen vegetables retain more nutrients than the non-local things I might get in the store. But we could do some of it better, too. If I ate more locally, maybe I'd avoid eating sugar altogether in favor of honey from one of the terrific apiaries we have nearby in Milford. 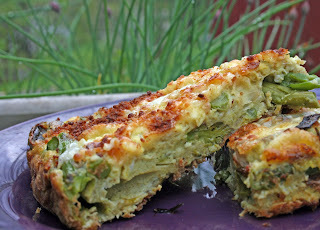 Perhaps being a locavore will come even more easily to us once our CSA shares start coming. One thing I did do right last year was to freeze rhubarb. We've had a rhubarb plant in the back yard for a few years now, and last year it produced a bumper crop. I scoured the web for information, and there seemed to be agreement about freezing, as long as you were going to use it in baked goods or sauces where texture wouldn't matter. I've been using it periodically throughout the winter, and it's been so nice to taste spring and summer when you least expect it. And whenever I use it, I find myself humming that song about rhubarb pie from A Prairie Home Companion. It so happens that tonight Steve and I actually got to see a live production of PHC at the NJPAC, and I came home thinking that I really ought to bake. Tomorrow we have visitors coming from Vermont: a fellow blogger and her family, who happen to be in town. Though I have no idea whether they'll actually want to eat, or whether they will have eaten already, I wanted to bake something for them, to celebrate their visit. And it seemed right, it being the week of Earth Day, to return to the bounty from last year's organic garden in my very own back yard. These are not vegan, as some of my baking is, because the buttery flavor really goes nicely with the cardamom, but you could substitute for the egg and the butter to make the more earth-friendly. 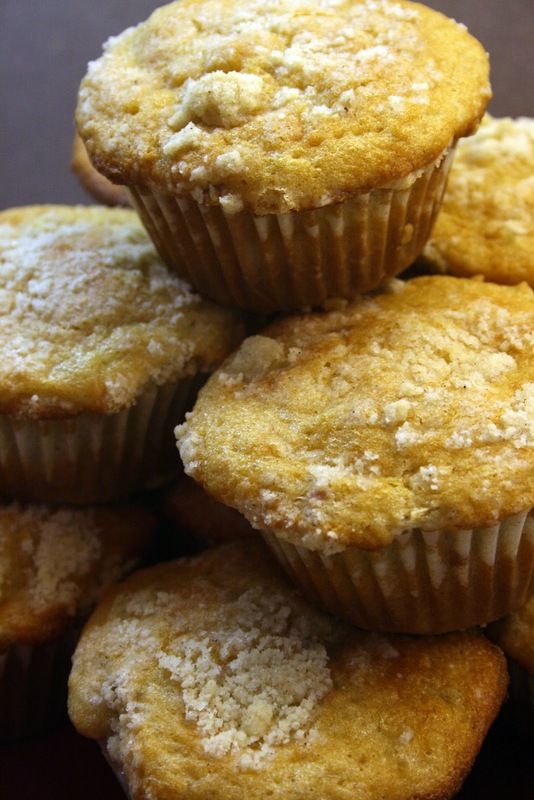 Be-Bop-A-Re-Bop Rhubarb Muffins, it is. Happy Earth Day! Whisk flour, sugar, cardamom, and salt in a medium bowl until combined. Add butter and combine with your fingers, rubbing the butter into the flour until mostly incorporated but some small pieces remain. (The streusel is ready when it holds together in large clumps when squeezed—it will still be fairly dry.) Refrigerate until ready to use. Heat the oven to 375°F and arrange a rack in the middle. 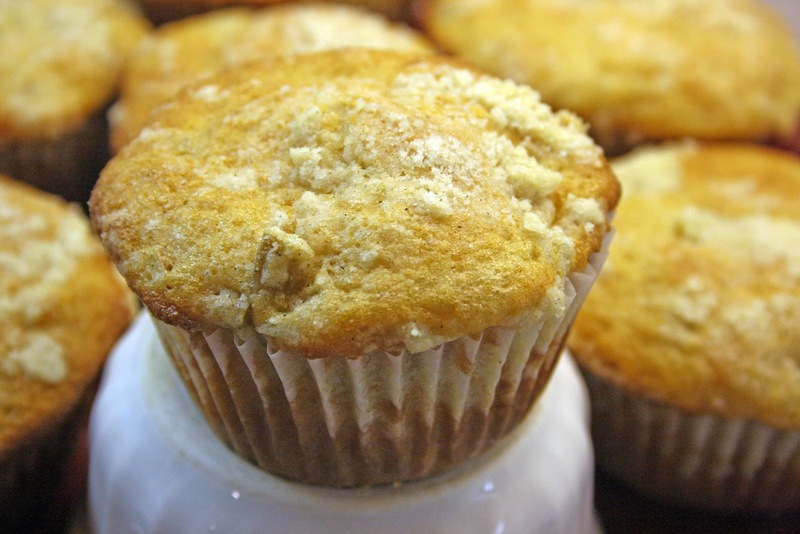 Coat a 12-well muffin tin with butter or line it with paper cupcake liners. Toss rhubarb with 1/4 cup of the sugar in a medium bowl and set aside. Let sit until rhubarb releases some juice, about 5 minutes. Place a rounded 1/4 cup of batter into each muffin well (the wells will be full) and evenly sprinkle streusel over top (I always end up with extra). Bake until a toothpick comes out clean, about 20 to 25 minutes. Remove to a wire rack and let cool 15 minutes in the pan. Remove from the pan and serve warm or let cool to room temperature. But yoga was amazing on Monday night; there were only four of us, and an assistant (I love being adjusted in class; is that weird? ), and I came out feeling like my body was humming. 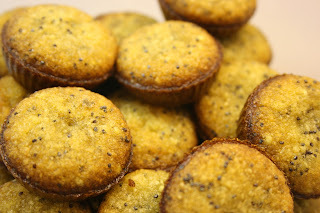 After my 9 pm conference call, I made gluten-free lemon poppy muffins for the newly-diagnosed-gluten-intolerant partner of my former boss, who is now retired and living happily in Carmel, CA. I wasn't entirely happy with those, so I won't post the recipe until I beta test some more, but I will extol the virtues of my peppermint patty and lemon cheesecake cupcakes, which I turned out last night. Today was my students' second-to-last class of the semester; on the last day we do evaluations, and in an effort not to appear as if I'm directly trying to win friends and influence students to say nice things about me on my evals, I figured I'd bake earlier rather than later. I wanted to do something different, but not too different. And I wanted to make something that would be "cool" flavored, given that it was going to be ninety degrees (yes, you read that right) in NJ. Here's what I wound up with. Preheat oven to 350 and line muffin tins with liners. Whisk soy milk and vinegar together, and set aside to curdle. Add the sugar, oil, vanilla and lemon extract to the milk and beat until foamy. Sift in the flour, cornstarch, baking soda, baking powder, and salt. Add in lemon zest and beat until no large lumps appear. Fill liners 3/4 of the way, and bake 18-20 minutes or until toothpick comes out clean. Cool. Beat butter and cream cheese well. Beat in powdered sugar until fluffy. Add vanilla and lemon zest and beat well. Pipe onto cooled cupcakes. Preheat oven to 350 and line muffin tins with liners. Whisk soy milk and vinegar together, and set aside to curdle. Add the sugar, oil, vanilla and mint to the milk and beat until foamy. In a separate bowl, sift together the flour, cocoa powder, baking soda, baking powder, and salt. Add in two batches to the wet ingredients and beat until no large lumps appear. Fill liners 3/4 of the way, and bake 18-20 minutes or until toothpick comes out clean. Cool. Beat margarine. Add powdered sugar and soymilk alternately while beating, in three additions. 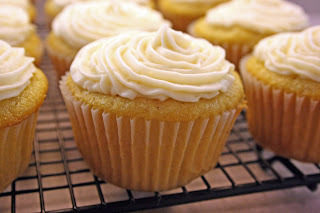 It should be fluffy; if it's too watery, add more sugar. Add extract and a drop or two of green food color. Pipe frosting onto cooled cupcakes. Melt together over a double boiler, stirring constantly, or microwave for 30 seconds and stir well. Allow to cool about 10 minutes. 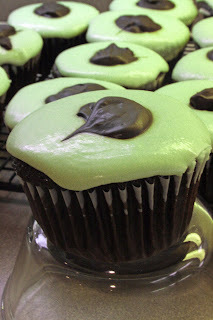 Drizzle/dollop onto mint frosting.